Cast your burden on Me and I will look after you. There are many places in the Bible where we are encouraged to cast all our cares on God. 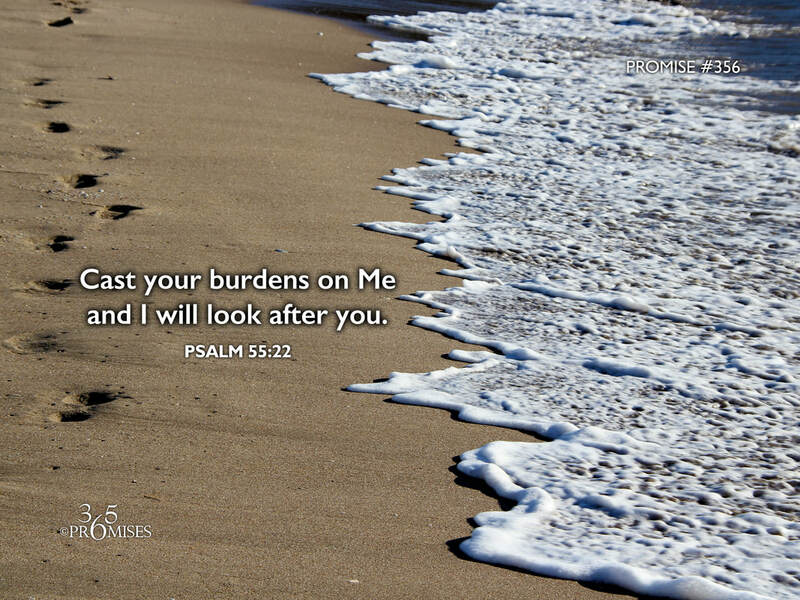 In today's promise, King David invites us in Psalm 55:22 to cast all our burdens on the Lord and He will look after us. The New Living Translation Bible says Psalm 55:22 this way... Give your burdens to the Lord, and he will take care of you. He will not permit the godly to slip and fall. When I think about this promise, I envision someone carrying a backpack full of rocks with each rock representing a care or concern. God invites us to take all of our rocks out of the backpack we are carrying and throw each one of them onto His big, strong shoulders. The reality is that we were not created to carry such burdens. Medical studies tell us that up to 80% of all illnesses are stress-related in some way. This statistic further demonstrates that the human body was never created to carry such stress in our backpack. So what can we do in response to today's promise? Empty your backpack of all your cares and cast each one of them upon God and He will look after you.